Since the last event at California Speedway I have been working on a number of areas to improve the performance of the car. My main focus was to work on improving the aerodynamics of the car. I added a rear diffuser, OEM rear deck spoiler, lexan side windows and a belly pan just before the rear diffuser. The goal was to improve overall downforce without a significant increase in drag. I also changed to different spring rates and alignment settings to optimize the car for the high speed corners at Buttonwillow. 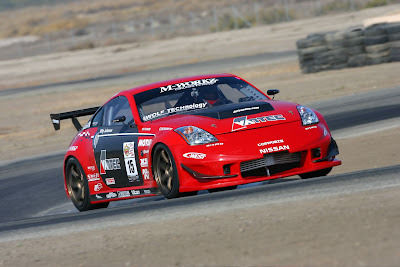 The car had run a best lap of 1:52.9" the last time it was run at Buttonwillow. The current record was a 1:48.5" set by an RX-7 last year. The first session out Billy Johnson fought his way through traffic and was able to clock in a mid 1:50" second lap. The next session which was the first timed session he ran a high 1:48" while the track was covered in dust and rocks from other cars spinning out. At this point we were on top of the time sheets and were nearly 5 seconds faster than our best time last year and within a few tenths of the record. After a debrief session with Billy we decided to change the alignment settings as that was the only tool available to improve performance. Billy went out with the changes and ran a 1:48.4" second lap. For the final session we decided to gamble on a set of Advan A048's that were offered to us. Since the Hankook's that we were running now had 3 events on them, they were pretty well used up. Unfortuneatly the Advans were slower on our car, so we did not improve our lap time. During the last session several other teams rolled out the brand new sets of tires to make up time. The final result was we ended up 4th despite breaking last years record. The new record is a 1:46.8", so clearly everyone is improving the performance of their cars. So our season ended up with 3rd at Buttonwillow at the Redline Time Attack, 2nd at California Speedway, 3rd at Long Beach, and 4th at Buttonwillow. The car improved dramatically this year and we will have to see what next year brings after the winter break. Once again I would like to thank all of my sponsors for making this possible. Without them, there is no way I can do this on my own. Steves 350Z is very quick. Everyone is improving, getting faster, and pushing the limits of what was quick last season.